Most people only use a few apps on their smartphones: according to research, smartphone owners spend 80% of their time in their three most-used apps. And as the app market matures, it turns out those three apps are usually owned by Facebook, at least according to download statistics. According to research by Nomura based on Sensor Tower data, looking at both iPhone and Android app stores, Facebook comprised 60% of app downloads last month. 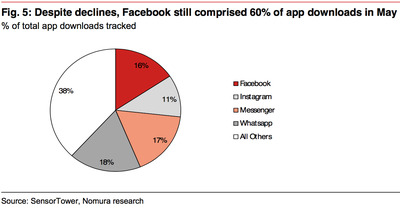 As Nomura researchers write, “Facebook is the clear leader in mobile,” although its download rates have been slipping lately.